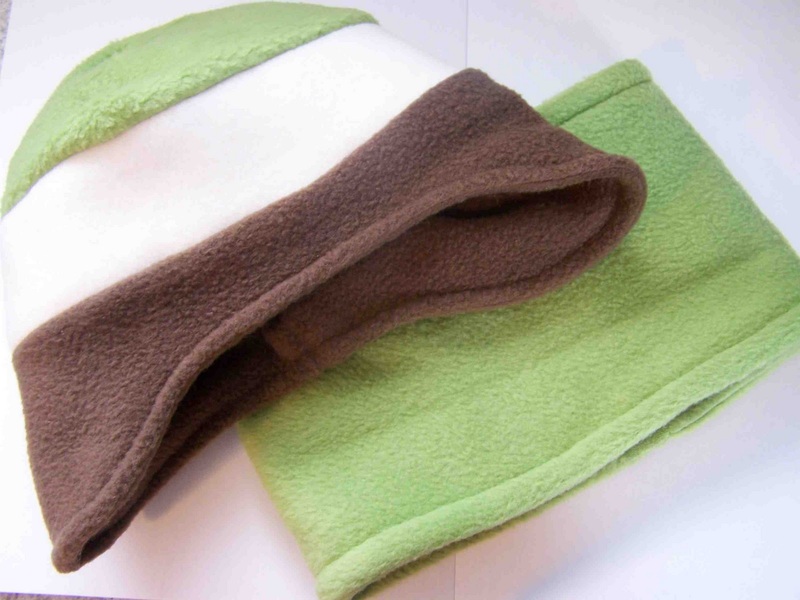 Yesterday I promised a tutorial for the lined fleece hat that accompanies the fleece neck warmer. Here it is. It is fairly easy and fast to make. Now, this hat is almost 100% inspired by Cheri's upcycled t-shirt hats. I modified her pattern to adjust the ear flaps, and line the hat. I'm not going to give you a full tutorial on the hat itself, but will show all of the adjustments that were made to end up with this. I'll refer you to her tutorial for the basic construction of the hat. This is obviously a different hat than the green and brown hat pictured yesterday. Hopefully it will prove how versatile this hat is. This cream on cream hat was made for the little girl that I babysit during the week. I love the flowers and the sequins. Rather than put a pom pom on the top of the hat, I opted for another flower. I think that it is a nice touch. Here's a quick shot of the hat that I made for Clark. 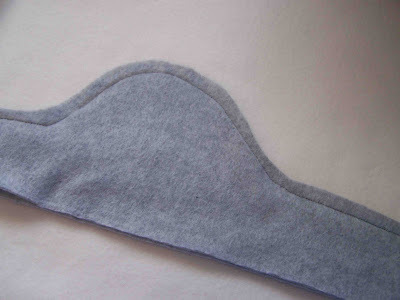 The first thing that I did to modify this project was to shorten the ear flaps from Cheri's pattern piece. I didn't need the flaps to be quite as long, and shortened them to about 4 1/2" and added a bit more width to them as well. You will want to cut out 2 pieces of material for each pattern piece. This hat is fully lined, so two pieces are necessary. 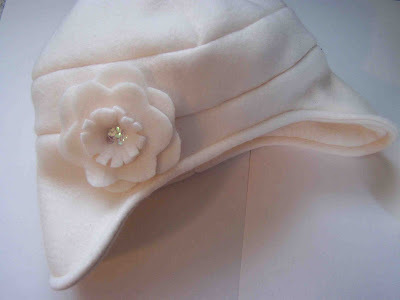 You will want to cut the four domes in the top hat pieces, just as in Cheri's tutorial. 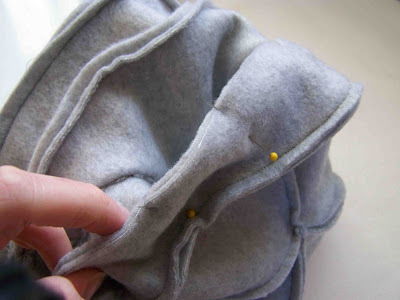 You will also want to stitch the domes together as in her tutorial. You will then attach the middle and top pieces of the hat. You should have two separate hat pieces when finished. (Sorry no photos). Lay the two ear flap pieces on top of one another. 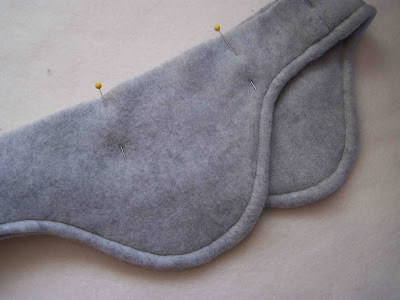 Stitch along the long ear flap edge, using 1/4" seam allowances. Your two ear flap pieces will now be connected along the bottom. 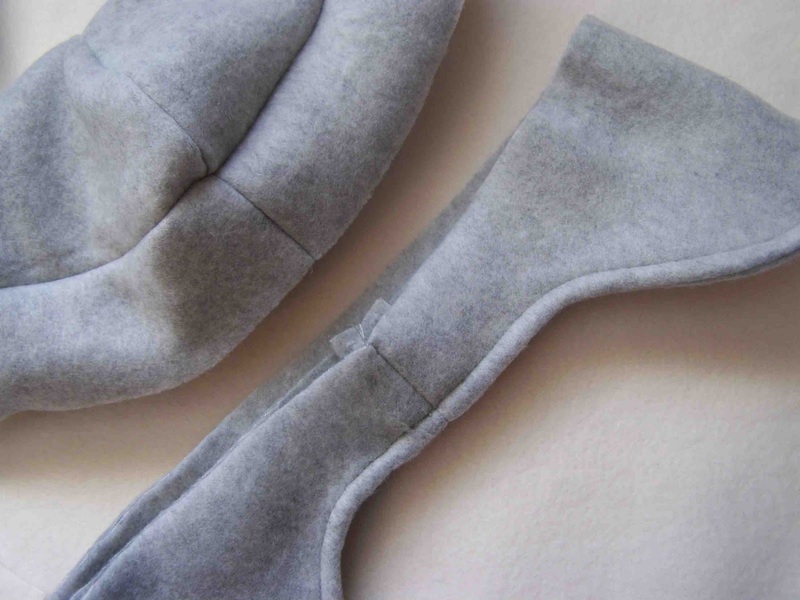 With a pair of scissors, clip the curves of the seam allowance. Take care not to clip your stitching. Open up your seam so that your ear flap piece lies flat. Pin the two open ends, with right sides together, forming a round. Match up seam lines. 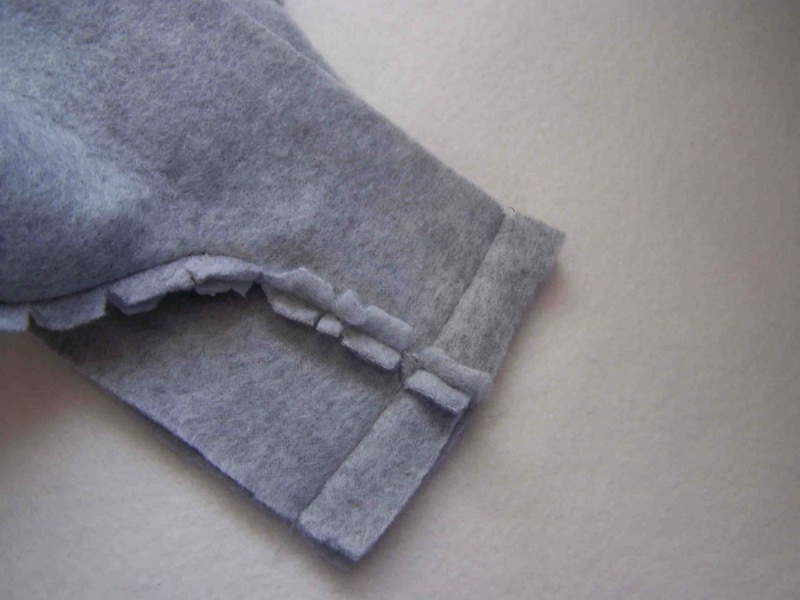 Turn in the new seam so that right sides are facing out, and seam is encased in your material. Pin the two layers of material together along the top of the flaps. Top stitch 1/4" away from the curved edge of the piece. 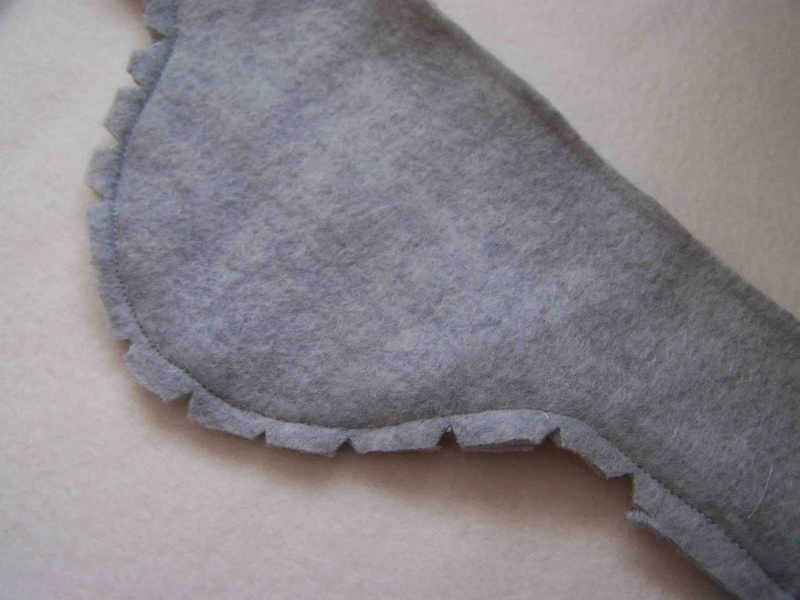 This will prevent your material from shifting when worn. Remove pins. You should how have two domed top pieces, and one double thick bottom piece. It's now time to attach the hat to the earflap piece. 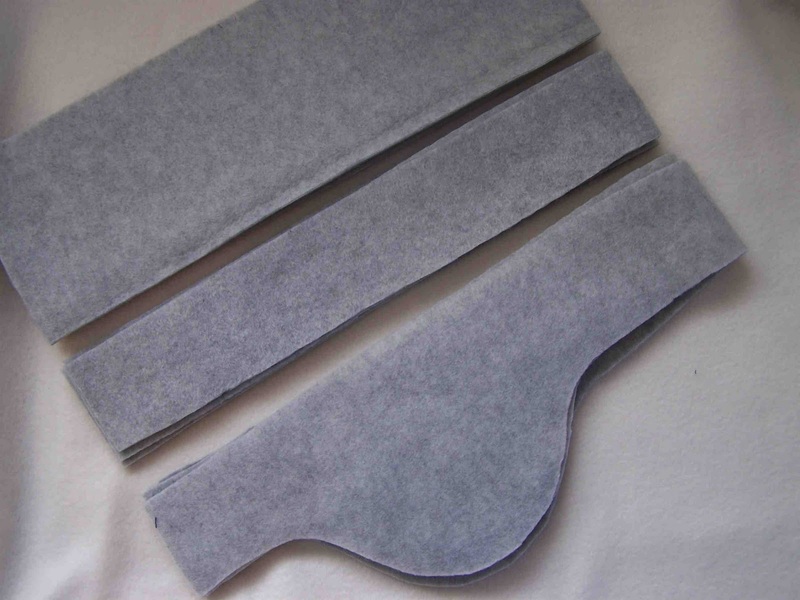 To do so you will separate the two thicknesses of material from the earflap section. Pin the right sides of the two pieces together, matching up raw edges. 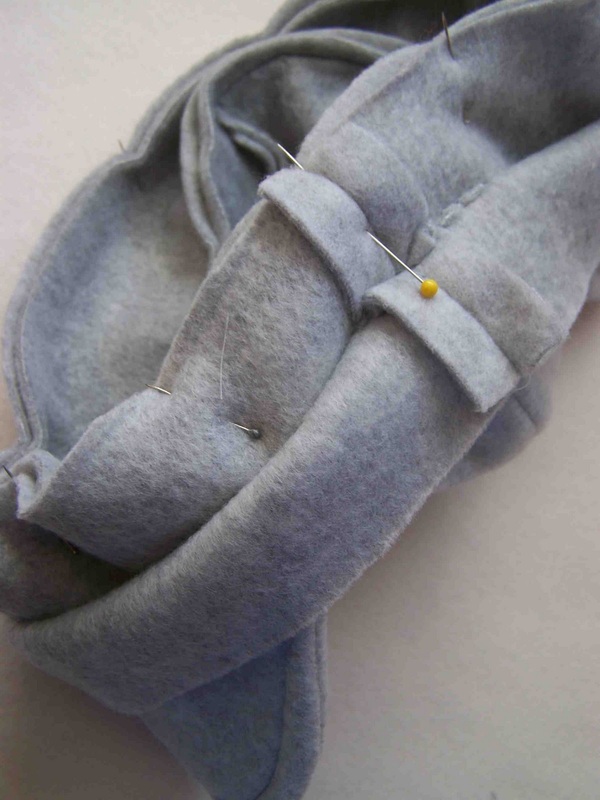 Fold the remaining thickness of the earflap away from the pinned seam. Stitch all the way around the hat, connecting the two pieces. Match up and pin the remaining thickness of the earflap section to the remaining hat lining, leaving a 4 inch opening for turning. Stitch around the seam leaving a 4 inch opening. Turn the hat so that all raw edges are encased. 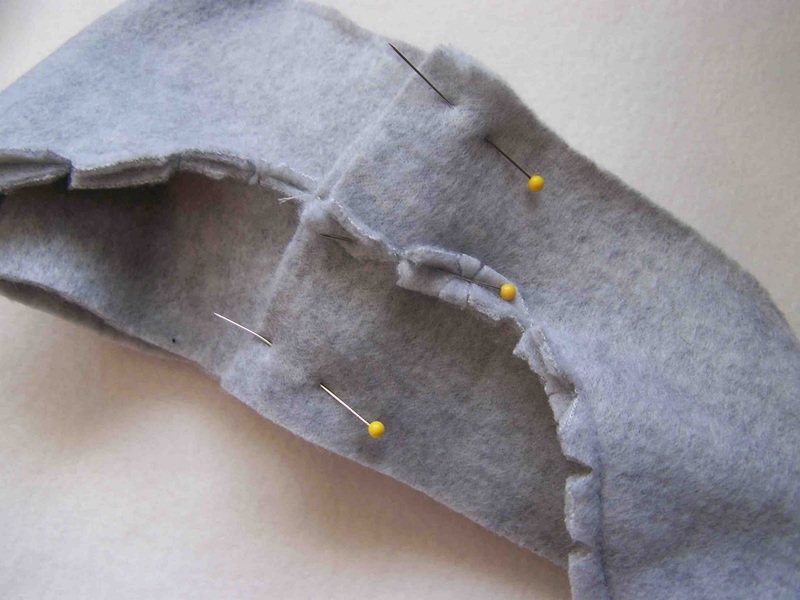 With and hand sewing needle, stitch the opening shut. Fold in the raw edges as you stitch so that they are encased as well. 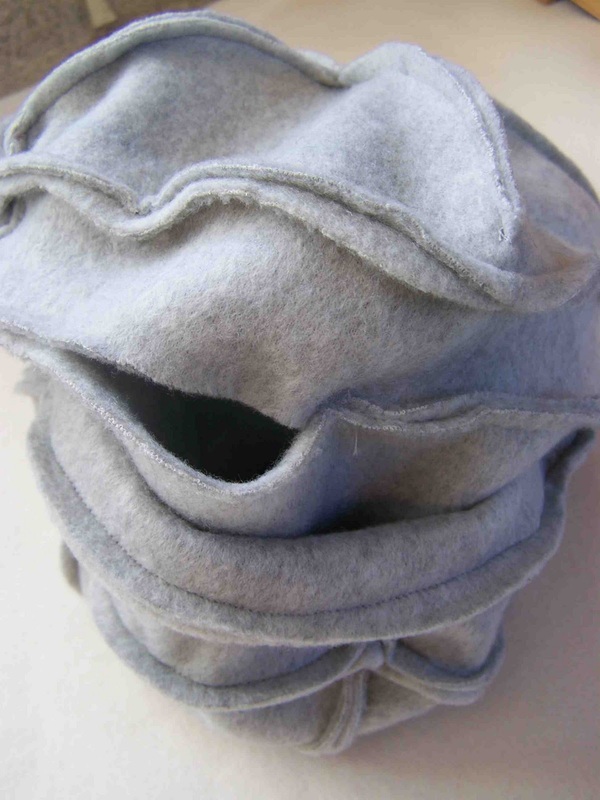 You should now have a fully lined fleece hat. To secure the lining and the hat, I recommend pinning the two layers of material together, matching up the bottom seam, and stitching in the ditch. You will sew right in the seam, anchoring the two layers together. It isn't necessary, but I think that it adds a nice finished quality to the hat. Now doesn't that boy look nice and toasty. 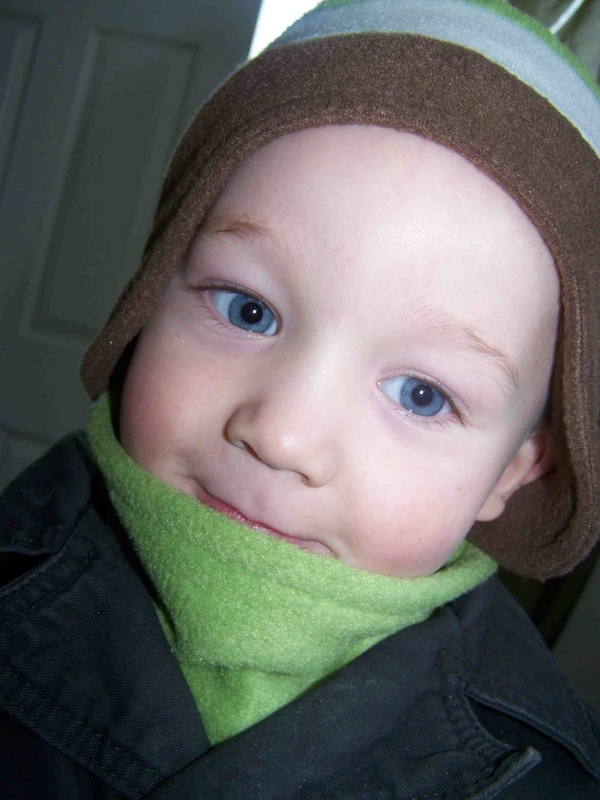 He loves his new hat and neck warmer. I love that I don't have to keep retying his scarf, or adjusting ear muffs. Thanks Cheri for such a great pattern to follow. 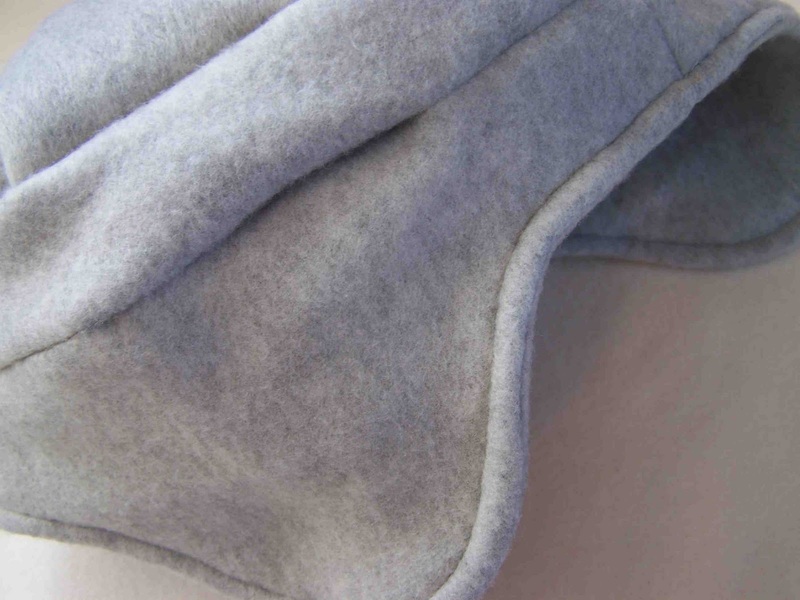 Note: Fleece does not shrink and does not need to be pre-washed. I recommend Blizzard fleece if you are shopping at Joann's. Anti-pill fleece collects quite a bit of lint, and causes a lot of static. Very cute! 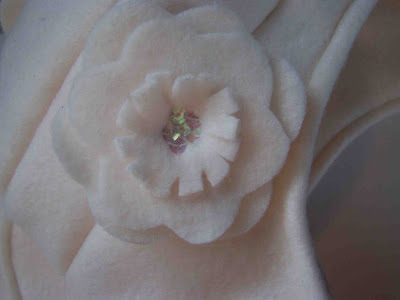 My 4 year old loves anything girly and with flowers, she will flip for this hat! I love it! The cream on cream is just adorable. These turned out great - both of them! 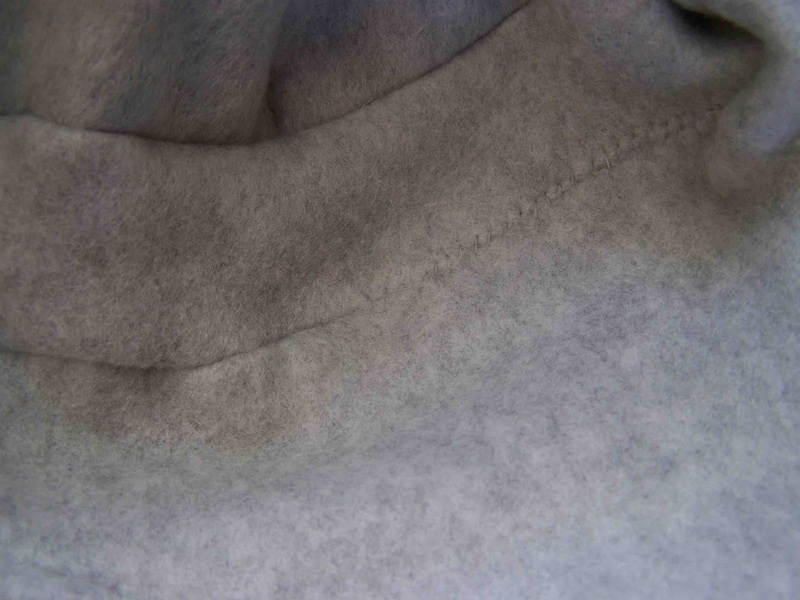 The fleece is a great option for winter. They look so cozy. Thanks for sharing this with me! Love the shape of that hat. Thanks for sharing! What a fabulous tutorial! Thank you for sharing! The pictures are perfect for the instrucitons! They are so pretty! you are one skilled lady! How Beautiful! I would love it if you linked it up over here http://www.worldshakingdesigns.com/2011/01/maegans-manic-mondays.html! I love the hats! So cute! 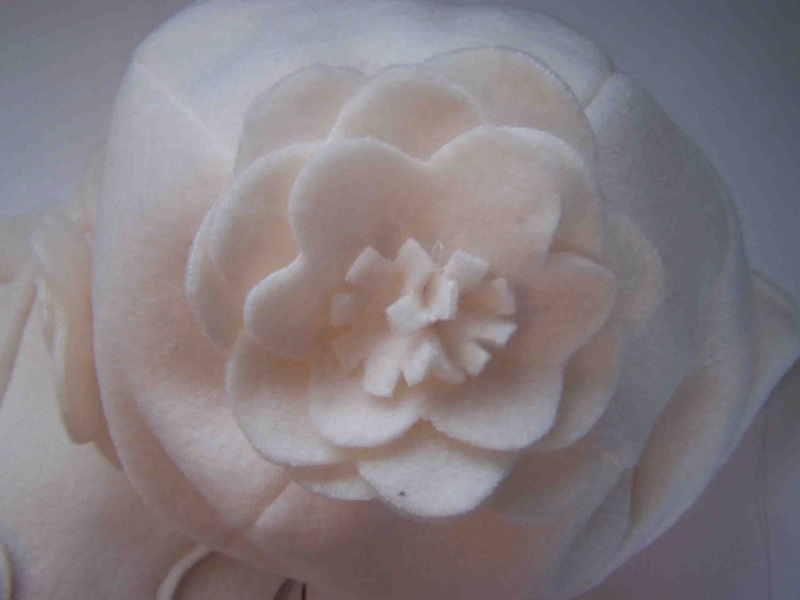 Love the flower instead of the pom pom, I'm assuming it was sewn on by hand, is the center is two small circles frayed? I'm about to work on one for my new niece about to be born today in New Mexico. Would appreciate any extra tips for the flowers. Thanks! this is amazing! could you post the dimensions of the rectangles you cut? Cute hat. Great tutorial! Thanks for sharing. lined fleece jacket with good quality fleece hat!